It's This or Murder...: Kingsford Charcoal and "Fire and Smoke": The Perfect Combination! 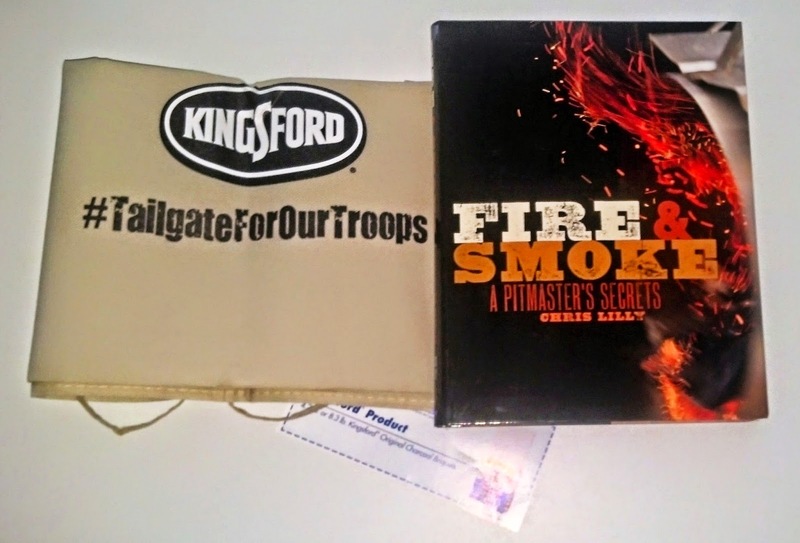 Kingsford Charcoal and "Fire and Smoke": The Perfect Combination! I love cookbooks. I love barbecuing. And now I love Crowdtap, because they hooked me up with both to do their #TailgateForOurTroops! 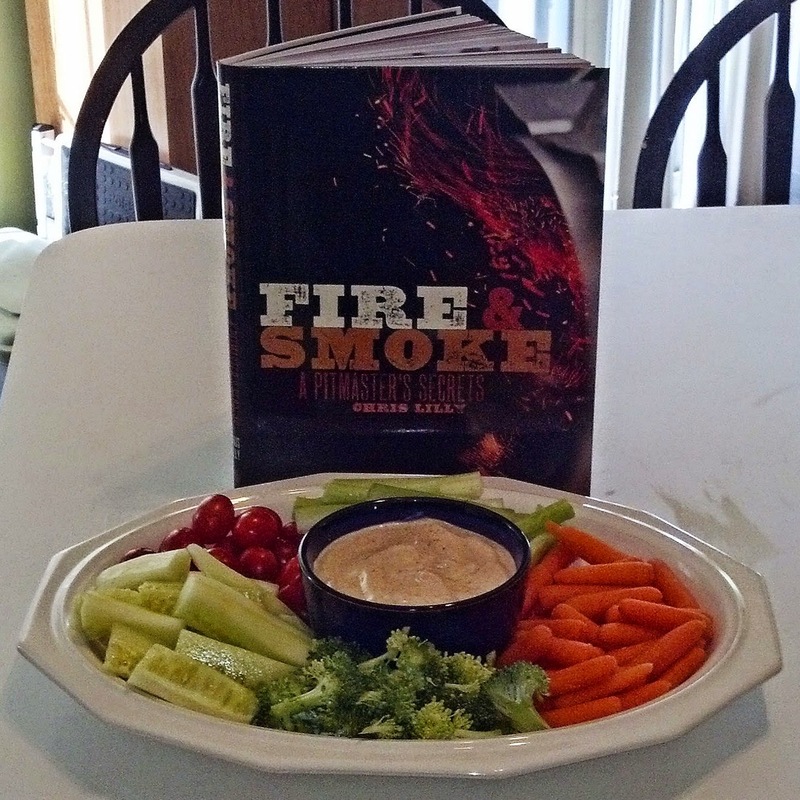 The cookbook is "Fire and Smoke", by world champion pitmaster Chris Lilly. The charcoal is Kingsford. The grillmaster is my husband. It's very simple to put together, but VERY tasty. The kick of cayenne and horseradish blends well with the other ingredients, which include, of all things, maple syrup. Seriously, though, it works. I've never seen a veggie tray be that popular before. But there is Kingsford Charcoal, so there must be fire! Back to the book. Now, I will say I will be hitting this cookbook often, because he really put together some really awesome recipes, like Curry Chicken Satays and Smoked Lamb Ribs with Rosemary and Fig Barbecue Sauce. There's sections for drinks, desserts, and even what to do with leftovers. I even found a recipe from my childhood. The popular local fundraiser in my hometown in Pennsylvania was the chicken barbecue, with the giant steel drums cut in half and the topper, this incredible white barbecue sauce. Well, Chris Lilly includes a recipe for just that. I will be all over it. Seriously...very cool cookbook. But back to the tailgate at hand. 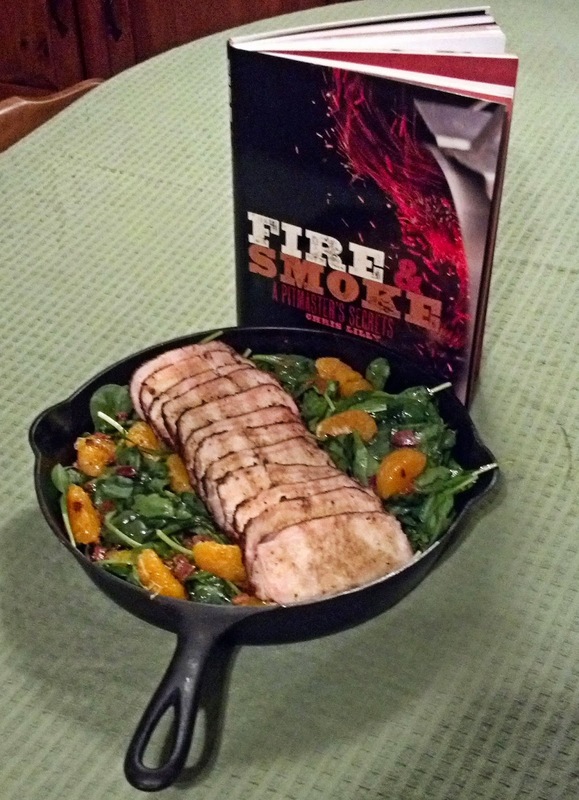 The recipe I settled on was the Smoked Pork Tenderloin with Spinach Salad. Oddly enough, it relies on an old-fashion cast iron skillet. First, there's a spice rub for the pork loin. 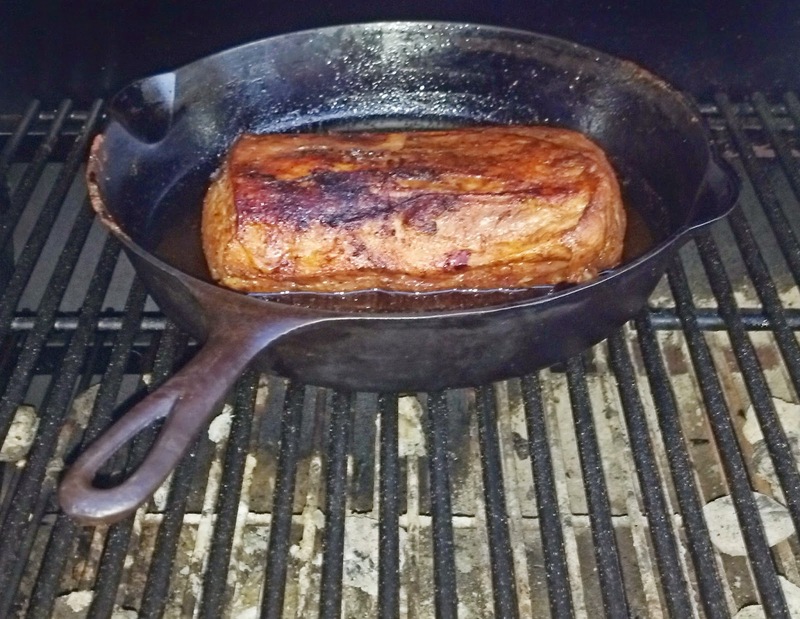 Then I cooked bacon to crisp, then browned the spiced pork loin in the back fat. 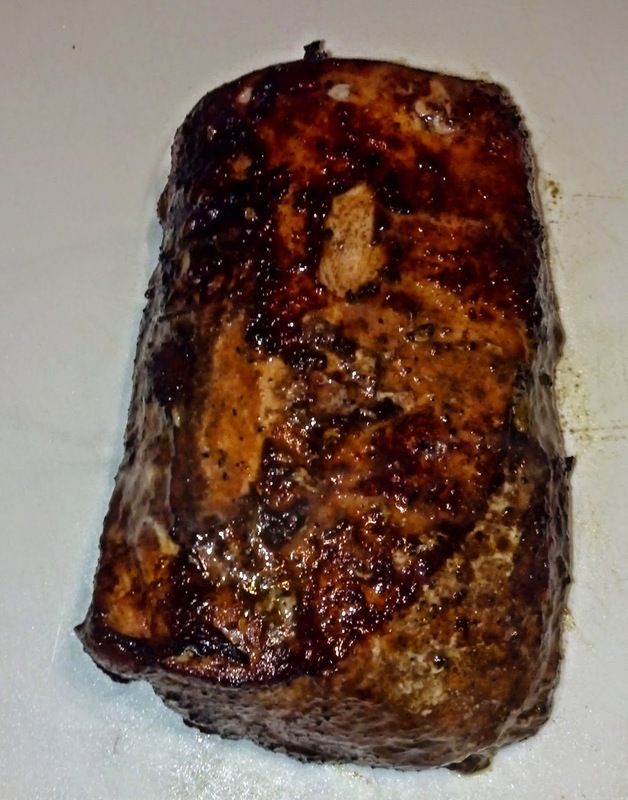 Next, there's a sauce that goes over the loin. Finally, still in the skillet, it goes on the grill, on indirect heat. Does it not look fabulous? After grilling to a nice 145 degrees, it's time to finish the dish. Let it rest on the cutting board, and cool down the skillet with cold water. The recipe actually called for a process that involved sauteing red onions in the juices, but as my family is not huge onion fans, I opted to leave them out. It's still delicious. Using the skillet as a serving dish, I added fresh spinach, that bacon from the beginning, crumbled, and fresh clementines that I'd peeled and sectioned. The recipe allows for canned Mandarin oranges if you don't want the trouble, but I decided to be a purist. I sliced the pork loin and arranged it, then drizzled it with this tasty dressing, also included in the recipe. Ta-da!! It comes out moist, tender, and with wonderful flavors. 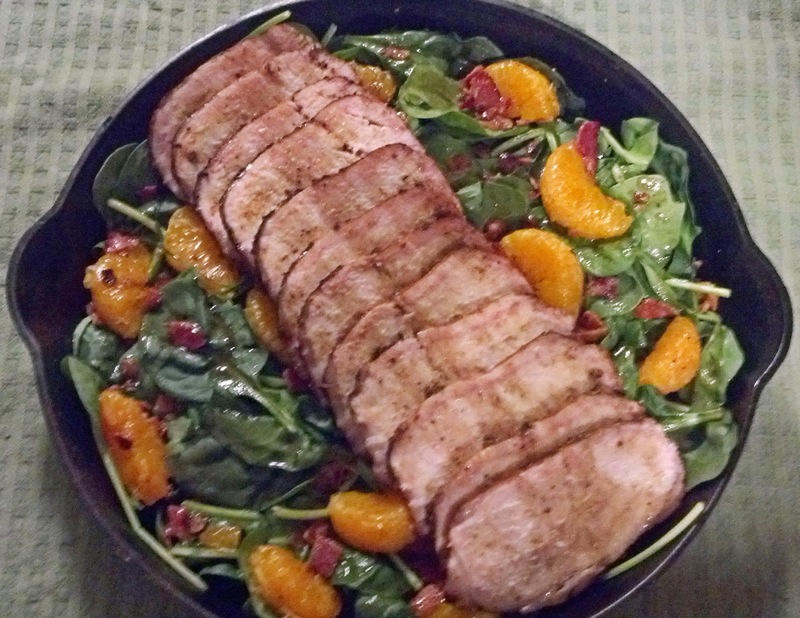 The slightly sweet dressing melds beautifully with the earthy spinach, and the bacon and clementines add salty and fruity elements that complement the smoky flavors of the meat. The presentation is fun, too. The entire family enjoyed it, even the little ones. 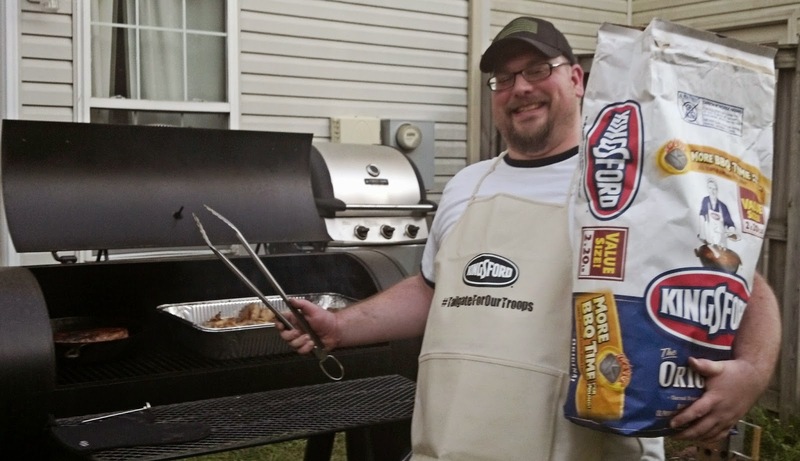 I can't wait to try more recipes, and I have a big bag of Kingsford Charcoal to do it with, because, well, it's awesome and our go-to charcoal. If you're interested in getting this tome of foodie fabulousness for yourself, you can purchase it here. It's also available in Kindle Edition.